June 16, 2010 by Mr.
It’s funny that even though True Confections never stood out in my mind as the best place for desserts, I’ve actually gone there quite a few times over the last couple years. A group of us paid them a visit after spending the day at the beach, and this will be my first review of True Confections. I like the open and casual style of the shop, but I’m sure a lesser man out there would’ve preferred it to be more cozy and romantic. It’s pretty neat that they have all their finished products on display, so you know exactly what you are getting a slice of. I must be getting old and feeble because I can’t believe I’m about to say this—they need to reduce their portion sizes, or at least offer ½ sized dishes. If you are heading in hungry and wants to get full, it’s perfect, but if you have had anything to eat within the last 3 hours, you are better off sharing an order. Out of the 9 of us, I’m the only one that finished what I ordered, and that’s because I only ordered a drink. Having had about two tonnes of meat earlier in the day, I wasn’t feeling particularly peckish. 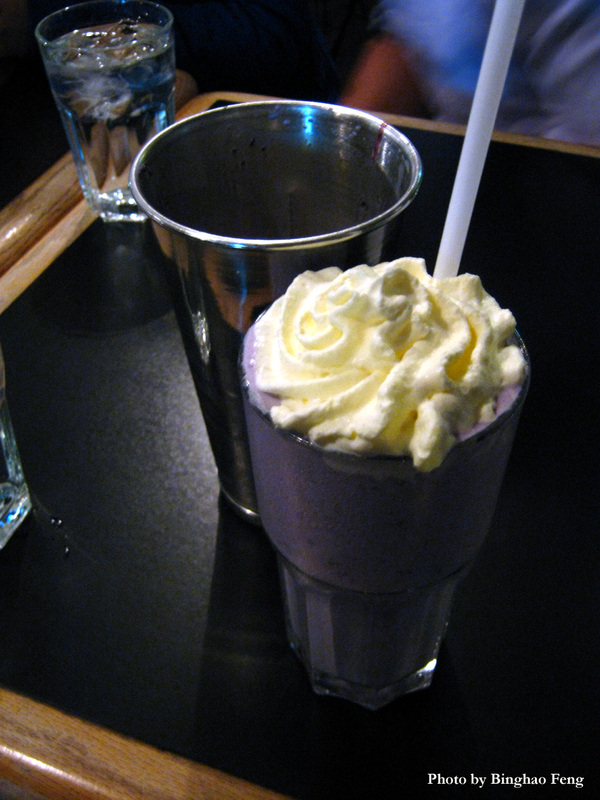 So I ordered a blueberry milk shake. I probably should’ve stuck with vanilla, strawberry, or chocolate. The taste of the blueberry is nice, but I don’t like how chunky the berry pieces were. It was like a party in my mouth, but not the fun kind. There was also the technical difficulty of blueberry pieces getting stuck at the end of the straw, blocking milky sugary goodness from getting inside my tummy. For the size of the drink (what’s in the glass as well as the metal cup), $6 after taxes is justified. Our waiter was very patient and friendly, and split up our group bill pretty quickly at the end. I feel like I’m saying this too often—good everything, but could also be better. However if you are looking for a late night post-dinner hangout in Kits, this is probably the best place.